Focusing on information and perspectives that have been misrepresented, suppressed, ignored, or otherwise excluded from mainstream discussion, Pinky and her friends use a variety of formats (i.e. short videos, ephemera, visual art, books and ‘zines, blogging, etc.) to explore the unseen world in a way that is easy to understand, with special attention given to reconnecting information (plentiful in our contemporary world) to its oft-ignored ethical and moral dimensions. Class Treason Stories (excerpts) will involve a multi-media installation that will provoke questions about the nature of education and the application of knowledge for either socially beneficent or individualist and competitive purposes. Featured Artists: Pinky and Bunny with assistance from Kim and Mimi. 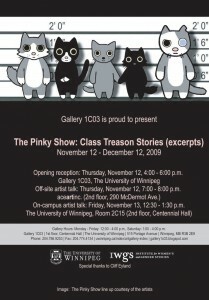 This exhibition was generously supported by: The University of Winnipeg, The University of Winnipeg’s Institute for Women’s and Gender Studies, Cliff Eyland, Toronto Free Gallery, and Fuse Magazine.